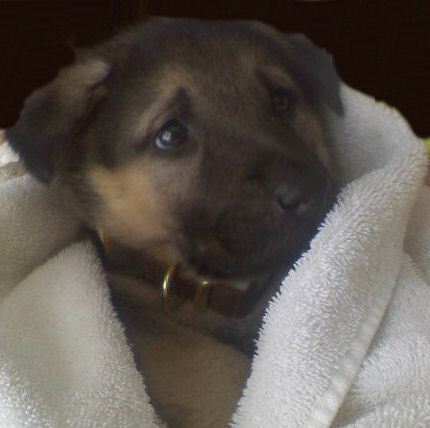 Not the best picture, all I had was my camera phone but it's such a cute photo of Rexxie as a puppy that I couldn't resist! Santa dropped her off to my son on Christmas of 2008 and he couldn't have been more surprised. Rexxie is sweet and LOVES to give kisses she is also very sly and tricky when she wants something she can't have. One day I was eating french fries for lunch and she wanted some but couldn't have any so after a few seconds of giving me puppy dog eyes she grabbed my purse off of the table (which she never normally does) and ran into the other room with it. My purse was open so everything dropped out of it. I put my fries down to pick up the contents and before I knew it she was trotting away with the box of fries in her mouth. It was very amusing knowing I was out smarted by my dog. Hello Patty, and thank you so much for sharing your great story about your new German Shepherd puppy Rexxie, the little stinker. What a great trick Rexxie pulled on you. It's amazing just how smart these German Shepherds can be - even as young puppies. And I'd like to take the time to say thanks to all our visitors for reading your story along with us. 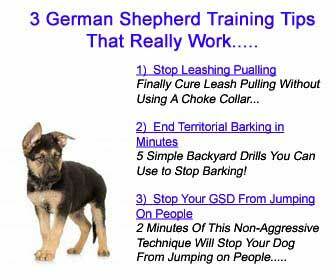 And here’s the challenge to all the visitors of Total German Shepherd - if you get the chance, please come back often to see what else is going on in our growing German Shepherd Dog community. BTW, please tell us also exactly what you think about the above story by leaving some interesting comments below. We would love to hear what you have to say. Thanks again.